When you start a new job, there’s a lot of paperwork to fill out, from direct deposit documents and benefits enrollments to your W-4 form. But when you’re a contractor or self-employed person, income taxes work a little differently. You will still have to report your earnings to the Internal Revenue Service (IRS), and the companies that use your services will have to report those earnings, too. That’s where the W-9 form comes in. The title of Form W-9 is officially Request for Taxpayer Identification Number and Certification. Employers use this form to get the Taxpayer Identification Number (TIN) from contractors, freelancers and vendors. The form also provides other personally identifying information like your name and address. The form acts as an agreement that you, as a contractor or freelancer, are responsible for withholding taxes from your income. When you’re a full-time employee, your employer withholds some of your income to cover federal income taxes and FICA taxes (which include Medicare and Social Security taxes). Employers do not make that withholding for contractors. At the end of the tax year, the business you did work for will use the information on your W-9 to complete a 1099-MISC. This form outlines all the payments made to you. A financial institution may also require you to report interest, dividends and capital gains earned by their customers. Who Has to Fill out a W-9 Form? W-9 forms are for self-employed workers like freelancers, independent contractors and consultants. You need to use it if you have earned over $600 in that year without being hired as an employee. If your employer sends you a W-9 instead of a W-4, the company has likely classified you as an independent contractor. You should confirm with your employer that this is the case. Knowing your status can help you plan your tax return. The W-9 form allows businesses to keep track of their external workforce. This means you don’t send your W-9 form to the IRS. Instead, you send it to your supervisor or the company’s human resources department. If you did multiple jobs for multiple companies, you could fill out a number of W-9 forms in the same year. You will also have to submit new W-9 forms any time you change your name, business name, address or tax ID number. How Do I Get a W-9? Most of the time, a company or financial institution will send you a blank W-9 form to complete before you begin business with them. 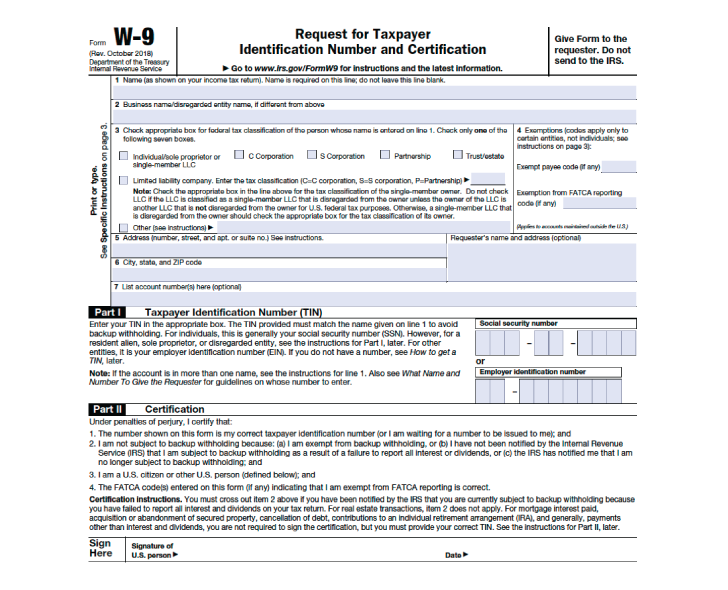 If you need to issue the form, you can download a W-9 from the IRS website. Filling out a W-9 is pretty straightforward. The form itself isn’t even an entire page long, excluding the instructions. The business that hires you should fill in its name and employer identification number. You’ll then fill out the form line by line. This should be your full name. It should match the name on your individual tax return. If you have a business name, trade name, DBA name or disregarded entity name, fill it in here. If you do not have a business, you can leave this line blank. This section defines how you, the independent contractor, is classified when it comes to federal taxes. You will check the first box if you are filing as an individual, sole proprietor or single-member limited liability company (LLC) owned by an individual and disregarded for U.S. federal tax purposes. A sole proprietor business operates under the owner’s Social Security number and hasn’t been registered as another type of business. Single-member LLCs are taxed the same way. The other boxes correspond to C corporation, S corporation, Partnership and Trust/estate businesses. The Limited liability company box is for a Partnership or LLC businesses with multiple members. You can check this box if you own an LLC treated as a partnership for federal taxes (fill in “P” in the adjacent space), an LLC that has filed Form 8832 or 2553 and is taxed as a corporation (fill in “C” or “S” in the adjacent space depending on the type) or an LLC whose owner is another LLC not disregarded for federal tax purposes (fill in the appropriate letter in the adjacent space). If your LLC has not filed a request to be taxed as a C or S corporation, it is taxed as a Partnership. The “Note” on the form clarifies the LLC-specific rules. You can always seek your attorney’s or tax advisor’s help to ensure you complete your form(s) correctly. You do not need to fill in this section as an individual. Only certain businesses or entities with any reason for exemption need to fill out these spaces. If this applies to you, you’ll need to provide a number or letter code that indicates that reason. If your entity is exempt from backup withholding, you’ll fill in the first line with your code. This should apply to most entities. However, if your business is not, the company who hired you for your services will need to withhold income tax from your pay at a flat rate of 24% and send it to the IRS. This is known as backup withholding. If you are exempt from reporting required by the Foreign Account Tax Compliance Act (FACTA), you will fill in the second line. The latter only applies if you hold your accounts outside the United States. If you maintain your account in the U.S., you can leave the second line blank or write “N/A.” If you’re unsure about your exemptions, Page 3 of the form outlines situations that would make you exempt. Line 5 requires the address (number, street, and apartment or suite number) where your employer will mail your information returns. The following line, Line 6, leaves a space for you to enter the city, state and ZIP code of this address. This is an optional line where you can fill in any account numbers your employer may need. Most individuals can leave this blank. You have two options in this section. You can enter either your Social Security number (SSN) or your employer identification number (EIN). Typically, you provide your SSN if you file as an individual or single-member LLC. Use your EIN if you file as a multi-member LLC classified as a corporation or partnership. If you are a sole proprietor, you could use either number, but your SSN is preferred. If you are a resident alien and you are not eligible for a SSN, you should use your IRS individual taxpayer identification number (ITIN). Again, you may want to check with your tax advisor or contact the IRS directly to double check your information. Providing an incorrect TIN can cause issues with your payments or tax return. It can also lead to future backup withholding. This is where you sign and date the form, indicating that you provided your accurate information. This is a legal document, so it’s important to read and follow all instructions carefully. Again, keep your safety in mind when completing and sending a W-9. Before you even fill it out, verify that the request for your form is legitimate. Also make sure to send the completed form properly. Use a secure method of delivery, like hand delivery, mail or encrypted file attachment. You want to make sure you’re not accidentally sending your personal information to the wrong people. What Is the Difference Between a W-4 and W-9? 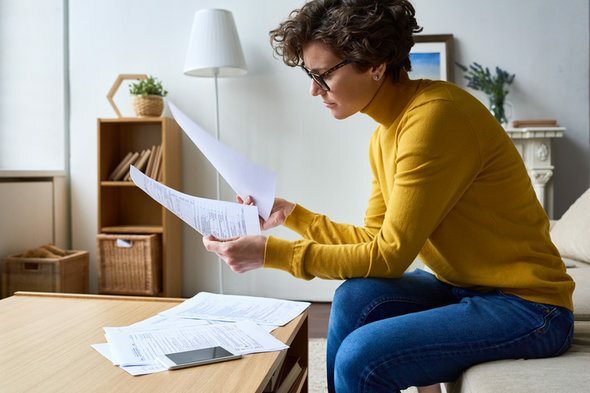 You will need to fill out a W-4 when you’ve just started a new job as a full-time employee or your financial situation has changed (while still remaining a full-time employee). A W-4 form requires some of the same information as a W-9, like your name, address and Social Security number. These forms also request information on tax exemptions. Employers use the completed W-4 to determine how much to withhold from your paycheck for federal income taxes. Since an employer doesn’t withhold income tax for contract and freelance employees, W-9 forms don’t request that information. What Is the Difference Between a 1099 and W-9? The 1099 and W-9 forms go hand in hand. Independent contractors fill out the W-9 to confirm their tax responsibilities and provide information to their employer(s). In turn, employers use a contractor’s W-9 to complete a 1099 detailing the worker’s income. There are 18 different 1099 forms, each one relating to the nature of the income. This includes freelance or contract income, but also real estate sales earnings, debt cancellation, pension contributions and more. The amount you need to report depends on the type of income, starting at as low as $10 for interest gains and reaching up to $20,000 for special credit-card transactions. As an independent contractor or freelancer, you’ll receive a W-9 form when you begin your work from the company using your services. Then in January, you’ll receive your 1099-MISC form that documents your annual earnings. When you file your federal taxes, attach each of the 1099 forms you have received. The company will also file your 1099-MISC with the IRS. A W-9 form is crucial to filing your taxes if you’re a contract worker, a freelancer or self-employed. 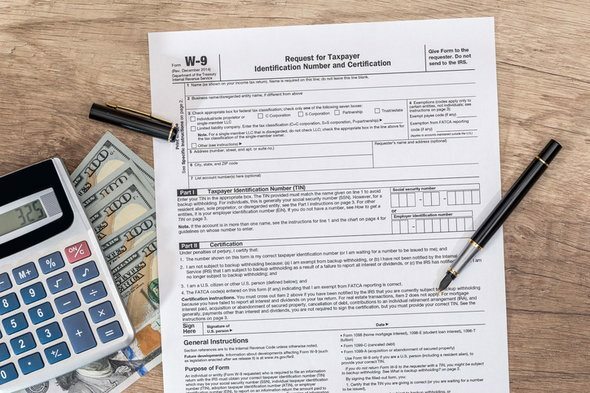 The companies you work with do not have to withhold paycheck taxes for you, and the W-9 serves as an agreement that you are responsible for paying those taxes on your own. It’s good to note that you do not send this form to the IRS. You send it to the employers who have requested it from you. While it’s relatively simple to fill out a W-9, always double check to ensure your information is complete and accurate. If you are unsure how to fill something out, consider looking for a tax accountant to help you make sense of your taxes. Although sometimes daunting, it’s important to start collecting your tax paperwork as soon as possible. That gives you time to do your calculations, collect the correct information and submit your taxes on time. For people who want some help staying organized, a financial advisor is a great resource. Our financial advisor matching tool can help you find the expert who best meets your needs. 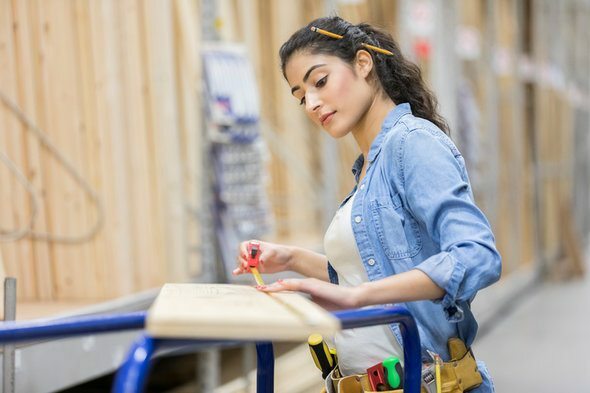 If you’re self-employed and have worked for a number of employers, you’ll receive multiple W-9 and 1099 forms. If you earn more than $600 from an employer, may also want to look for a W-2 form in January instead of a 1099. The W-2 is necessary whenever an employer withholds taxes from your paycheck. Using the right tax filing software can help you ensure that all your tax forms are correct. If you aren’t sure which to use, consider two of the most popular services, H&R Block and TurboTax. They both offer clear explanations of the process and a smooth filing experience. Here’s a closer look at whether you should choose H&R Block or TurboTax.